OHDA was generously funded by the Institute for Museum and Library Sciences, an agency signed into law in 1996, bringing together the Institute of Museums Services and the Library Program office. The development is one of vision, fitting in a digital world. Beginning in the later 1980’s and early 1990’s, satellites, fiber optic cables, computers and software promised to make a growing number of resources housed in libraries and museums available to any and all of these institutions and their visitors. This development was especially salient for oral history. Prior to the digital revolution, collections often languished in boxes, available only to people who would take the time and energy to visit an archive. Yet with the digital revolution access to oral histories has been greatly enhanced and yet more can be done. Not only do we need to think more about the standards for digital video, but we realized, and perhaps more important, that oral history could become a lens for us to explore how digital collecting, curating, disseminating and sharing resources happens across institution types (museums, libraries, and archives). So, within IMLS National Leadership project, oral history became a focal point for the broader question of how to use technology to share resources and bridge the gaps between institutions and the people that operate them. That is where our story, and survey, begins. Fifteen years into the digital revolution and the tenure of IMLS, OHDA was funded. The project began with a survey designed to assess who was sharing resources, how they saw themselves (e.g. their professional identities), and how these digital collaborations influence institutional missions. OHDA, first and foremost, needed to measure the landscape and beliefs about digital oral history that had developed over fifteen years. More than 200 people responded to the survey. Results would provide a framework for the design of best practices. If the survey showed digital networks had created a relatively homogenous audience, with a narrow set of questions and concerns, that result would suggest one kind of best practices, relatively simple and direct. However, results could not have been more contrary. 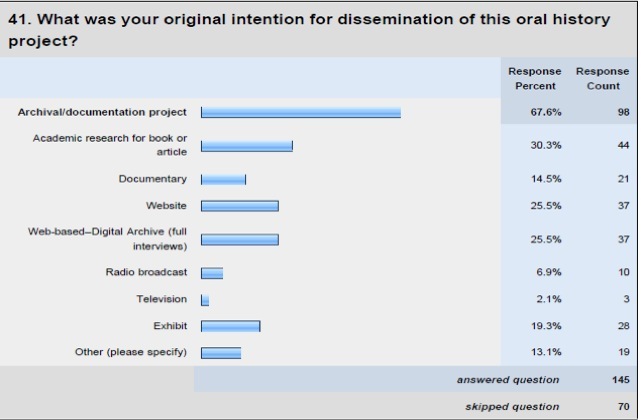 The survey, administered via the web, showed the constituents concerned with oral history were rooted in a diverse set of disciplines, with a broad range of priorities, imperatives, and skills (see Figure 1). What was the most immediate result? The professional identities and vocational interests of respondents were robust, varied, and insular. Despite building IMLS from two organizations, one dedicated to museums, the other to libraries, the results revealed that the actual constituencies associated with oral history went far beyond traditional vocations of librarian, curator, and scholar. Dozens of respondents suggested they were folklorists, linguists, videographers, IT professionals, anthropologists, teachers, historians, and beyond. And some were a blend of these identities. Their affiliations ranged as well. Some had affiliations with established museums and libraries, but others were at universities, in community groups, various NGOs, and independent researcher. Seventy three chose “Other” when describing their affiliations. A meeting in Washington, D.C. intended to vet the results of the survey erased any doubt about how complex an audience OHDA had to serve, and how underserving the audience might bring early obsolescence to results of the project. Several participants suggested they abandoned the survey after not finding their vocation listed among many choices. They did not find the option of adding their profession under the old reliable “Other” palatable, because if their profession was not listed, the survey might possibly misconstrue their responses, or the questions might be make sense for their professional work. Vocational and professional identities were essential to respondents, and would likely frame their approach to using OHDA best practices. We needed to prepare for a notably diverse professional audience. This might be the most salient result from the project. Beyond the challenge of accommodating a broad range of professional identities, survey results showed that aptitudes for and experience with digital technologies varied widely, from pure novice to international authority. Overall, about 50% of the respondents had received at least some training in conducting and recording audio/video interviews. 1. The transition to digital among oral historians appears to be well underway. A large majority of respondents (83%) reported that they have been recording digital audio and/or video for a year or more. And a large majority of the remainder reported that they expect to do so for the first time within the next year. 2. Despite the widespread use of digital recording methods, there is considerable room for improved understanding of the technologies involved. Almost half of the respondents were unaware of the sample rate or the bit depth of their most recent recording. 3. Issues of transcription continue to be notable for the oral history community. Nearly 80% of respondents reported that they either transcribed or have plans to transcribe the interviews from their most recent project. Finally, with respect to dissemination, when asked to describe goals for their most recent oral history projects, again the range of outcomes proved daunting (Figure 2). Differences also abounded in the ways oral histories were recorded, from writing them down to professional audio/video productions. In some cases, results seemed conditional on respondents training and work environment. 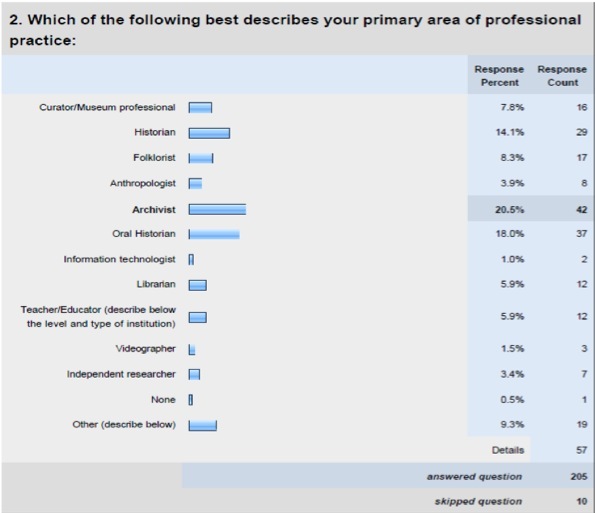 Despite small sample sizes, it seems museum professionals were much more likely to use video than historians when doing oral history. These differences in practice, across professions, were essential to identify. They are functional barriers to collaboration between historians and museums, and they suggested that an OHDA site on best practices needed to change how practitioners come to understand their role in the oral history community. Our data were telling us, that if best practices were to bride gaps, they had to teach each user how other members of the OHDA community might utilize their work, and how that imperative should guide them to develop inclusive project requirements, plans and desired outcomes. Oral history is a valued resource for so many different reasons, in both disciplinary and interdisciplinary fields. There seems to be no end to reasons it is collected, curated and disseminated. This insight would guide the design of best practices. Resources produced by OHDA would not suggest unconditional answers, but contextualized options suitable for a complex world that does not always share easily. Cohen, S., Rakerd, B., Rehberger, D., & Boyd, D. A. (2012). Oral history in the digital age: the imperative for rethinking best practices based on a survey of the field(s). In D. Boyd, S. Cohen, B. Rakerd, & D. Rehberger (Eds. ), Oral history in the digital age. Institute of Library and Museum Services. Retrieved from http://ohda.matrix.msu.edu/2012/07/ohda-survey/. Steve Cohen, Brad Rakerd, Dean Rehberger and Boyd, Douglas A.,. “Oral History In the Digital Age: The Imperative for Rethinking Best Practices based on a Survey of the Field(s),” in Oral History in the Digital Age, edited by Doug Boyd, Steve Cohen, Brad Rakerd, and Dean Rehberger. Washington, D.C.: Institute of Museum and Library Services, 2012, http://ohda.matrix.msu.edu/2012/07/ohda-survey/.